Liquid crystals—much like the ones forming these words on computer monitors—could be tuned to fight bacteria or scuttle compromised electronics by reacting to subtle changes in their environment with tiny, measured doses of liquid or solids. Researchers at the University of Wisconsin–Madison have developed liquid crystal films and droplets that can hold a wide range of "micro-cargo" until their release is cued by body heat or a beam of light or even the wake of swimming microorganisms. The trick is in exploiting the way liquid crystals can be organized, as UW–Madison chemical and biological engineering professor Nick Abbott and members of his lab describe today in the journal Nature. "In a typical liquid, like water, the molecules are all jumbled. A liquid crystal is also a liquid, but the molecules line up. And they line up over very long distances, as long as 100,000 molecular lengths," Abbott says. "The fact that they line up like that gives rise to mechanical properties—what we call elasticity. We're manipulating that elasticity." In a liquid crystal display like a TV screen, the orientation of the liquid crystal is changed by applying an electric field. Different orientations change the colors and shapes on the screen. Abbott's innovation takes advantage of similarly sensitive liquid crystal films. "Inside the film, we've put tiny droplets that contain some active agent. They're about a micrometer or so in size, a little water pool," he says. "You can trap these droplets inside the film of liquid crystal, and in response to the stimuli, we can eject them." The researchers suspended tiny doses of an antibacterial compound in a liquid crystal film while the crystal's molecules were lined up neatly in one direction relative to the film's surface and then submerged the film in water with some bacteria. "Bacteria typically move with a flagella, a sort of tail they rotate that drives them through fluid," says Abbott. "What we were able to show is that if bacteria come down to the film's surface, the movement of their flagella transmit a shear stress on the film." The stress disrupts the liquid crystal's orientation. As its molecules wobble out of alignment and reorient, they allow blobs of the micro-cargo to slip out of the film to mix with the water. The change in alignment of the liquid crystal also generates an optical signal, reporting the arrival of the bacteria. "The presence of the bacteria releases the antibacterial agent. When the agent kills the bacteria, the bacteria stop moving, so the release stops," says Abbott. "That's what's interesting. I'm not aware of another material that has this property, this sort of internal control inherent in its structure." 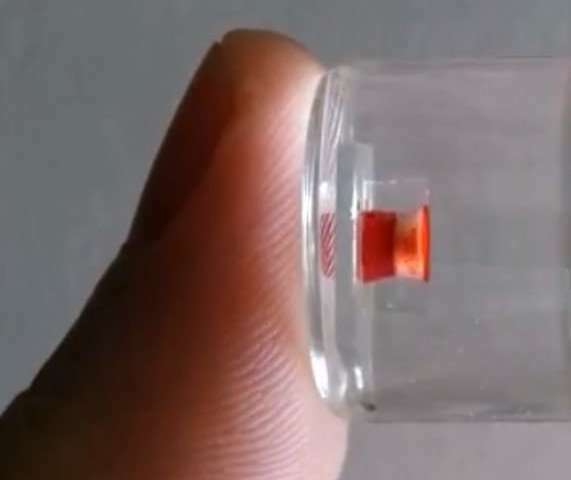 Other methods for releasing small quantities of medication or chemicals tend to require control from electronics and moving parts in tiny valves, or they release all their cargo in a single shot or imprecise amounts—unlike the liquid crystal, which can repeat delivery in precise quantities. "A common way to manage bacterial contamination is just to leach bacterial agents into a solution or onto a surface, but you're leaching them whether the bacteria are there or not," says Abbott, whose work is supported by the U.S. Army Research Office and the National Science Foundation. "This material can sit dormant for a very long time, not releasing anything. It's only in the presence of a cue from its environment—like the movement of live bacteria—that it would release its agent." Abbott—and postdoctoral scholar Young-Ki Kim, recent graduate students Xiaoguang Wang and Emre Bukusoglu, and undergraduate Pranati Mondkar—also showed that the heat from the surface of a finger can prompt liquid crystal to release micro-cargo, and Abbott says the films or droplets can be doped with molecules that make them light-sensitive or respond to an electrical charge like an LCD screen. There's another handy feature the films share with liquid crystal displays. "It can tell you when the micro-cargo is released, Abbott says, "because there's also an optical signal generated when the liquid crystal is reoriented. It's self-regulating and self-reporting." The films could use this built-in signal to announce how many times they've released cargo—or when they've run out. While the Nature study used an antibacterial application as a demonstration, Abbott believes liquid crystals could be useful in all sorts of applications—from doling out medication to relieve the stress of a constricted blood vessel, to releasing corrosive fluids to self-destroy the circuits of a compromised computer.